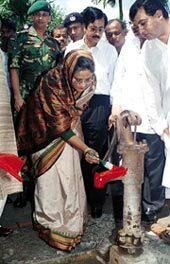 the Bangladesh government has finally given the green light to the much-awaited National Policy on Arsenic Mitigation. It was recently cleared by a cabinet committee headed by the country's Prime Minister, Khaleda Zia. A nine-member group of secretaries and a panel of experts have framed the policy. "We have consulted a number of entities and individuals such as donor agencies and local groups. All the important suggestions have been incorporated in the final document," reveals A Y B I Siddiqi, former secretary to the government, who was involved in the policy formulation process. "Now the government will implement it with full force," he adds. The policy contains a set of guidelines and protocols, called the implementation plan, which are to be followed in arsenic-affected areas. Out of the 64 districts of Bangladesh, 59 are reeling under arsenic contamination, threatening the health of around 30-40 million people (see: 'The dark zone', Down To Earth, April 15, 2003). As indiscriminate digging of tubewells is believed to have aggravated the problem of occurrence of arsenic in groundwater, such activities have been discouraged. Furthermore, the conditions under which tubewells can be dug have been specified. Groundwater is to be tapped in an area only when there is no alternative source of water such as ponds and dug wells. The policy mentions that though piped water is also an option, it is expensive. It sets a protocol for validation of water purifying devices, which are flooding the Bangladesh market at present. Some companies are selling handpumps or tubewells that are claimed to be arsenic-free. "From now onwards, all water purifying devices will have to be tested by the government. Only those that have government certification can be sold in the market. Till now only five such devices have been certified," discloses Siddiqi. He says that since monitoring the sale of these devices would be a Herculean task, the central government would involve local governments in the process. The disposal of toxic arsenic sludge generated from treated water would also have to be conducted in accordance with a set of rules developed by a panel of scientists. At present, the government, along with the World Bank, is surveying all tubewells and handpumps in the country. Those found contaminated are being painted red. The government plans to revisit these units after six months. While experts have welcomed the new policy and described it as comprehensive, they feel that the real test lies in its effective implementation.